My last year's top 10 post was based on the personal story that came with a particular nail design. I'd like to change that for 2012. I'd like to focus on what you had to say and how you felt about my nail art. With those in mind, I'd like to share with you my Top 10 Nail Art Designs of 2012 based on the page views, social media shares, and comments. I was actually surprised when this design made it to the top 10 because until I reviewed the designs for this blog post, I thought that this is just a personal favorite. Yes, it remains to be one of my designs that I love. Well, probably because I am nocturnal and I can relate to it very much. Surprisingly, I realized that a lot of you really appreciated this design. 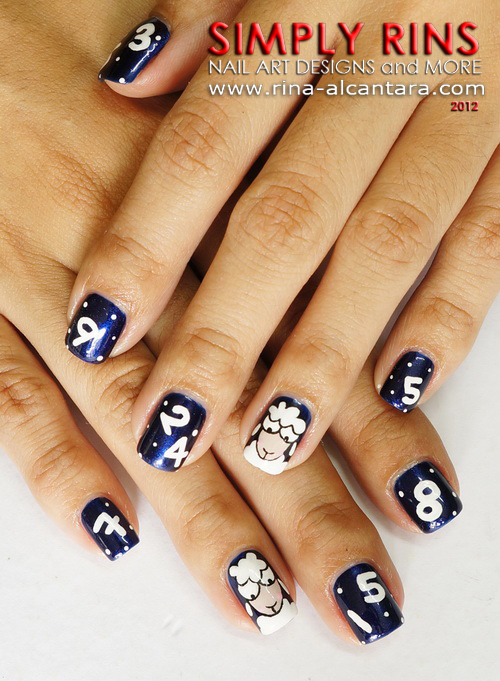 Overtaking the Counting Sheep is a nail design on flowers! This nail art has been recreated by many nail art enthusiasts using different color palettes. It is well-loved vintage design and I'm happy that my version was loved by many, too. This is also personally memorable. I wore this during a casual business meeting that was sort of disappointing in the end. The 8th spot goes to a nail design that was particularly challenging for me to paint. But I loved it and I'm happy that it received a lot of wonderful comments. At the time I was thinking about making this design, I really wasn't good with painting roses. And that actually made me decide to paint rose buds instead. I was proud of the results and eventually, I made a tutorial (view here) to answer requests. A colorful nail art made it to the 7th slot. This has been one of my nail designs that I really enjoyed doing even if it was a little difficult to come up with unique patterns for each nail. I'm thankful that this is one of the aztec/tribal nails that has been liked and shared online. And surprisingly, some of my guy friends particularly liked this! Compared to 2011, I only a few Christmas inspired nail art during 2012. My dream to experience snow during the holidays inspired me to create this Christmas nail art and with a video tutorial that I had time to create. I received a few emails from other nail artists that recreated this design and I am thankful that they were inspired to do this. This design had a controversial title. Well, simply because it looked like a close-up of roses when I finished. But initially, my idea is to come up with an ombre manicure with ripples, sort of like waves. I guess how a certain nail design may look differently depending on how a person will look at it. I remember wearing this design for about week, which is usually my indication that I really like it. 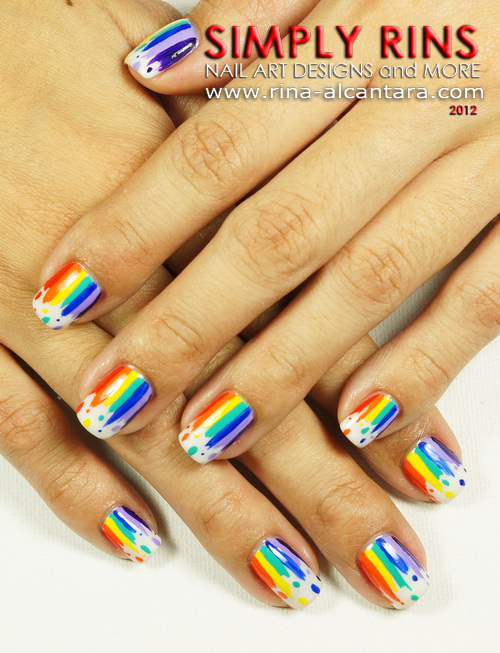 This is also a favorite among nail artists who were looking for inspiration for the next nail art. Black cats ruled the no.4 spot on our top 10 list for 2012. Who would have thought, right? I wasn't into yellow polish since I've discovered Dazzle Dry Sahara because I didn't know if I could pull off wearing such an attractive color. I was trying to come up with a fun mani for Halloween when I decided to paint my nails with black cats. This nail art has inspired some of you to recreate it and I appreciate those that let informed me. Our 3rd placer goes to another colorful nail art design. I made it as a tribute to a friend who is the epitome of cheerfulness. She has been asking me to do a rainbow nail art for ages and I think it suited her personality well. It received a lot of raves over Pinterest and I'm glad that it did because I really liked how this design turned out. It looks complicated at first but it is actually quite easy to do. If you're interested, follow the link and you'll find a video tutorial at the bottom of the post. The first runners up goes to a Valentine's nail art that I called Heart Patches. From all my nail designs, I received the most requests to create a video tutorial for this. The idea for this came to me when I was thinking how to express a broken heart to my nails without looking so sad. I thought painting heart patches would do the trick. I even used a non-traditional color for it. And as I write this post, I realized that those designs that are personal to me becomes the more popular ones. I guess when the heart is involved in anything, it really stands out. IKR?! This simple design have more than 15,000 shares on Pinterest alone. Truly, a simple design of having just an accent nail can be beautiful. I wore this when I attended the Miss World Philippines 2012 and I wanted something elegant to match my blue dress. I also didn't have much time so I only painted 2 accent nails. It looked like porcelain so I named it such. This look is my no.1 nail art design for 2012. There you go! Was there a nail design you saw in my blog that you think should be included in the list? Do you have a different no.1? Cheers to more nail art designs for 2013! I'm surprised but also not surprised at number one! That manicure is stunning! wow 15,000 shares. truly a # 1. Your designs are all wonderful!